Now I know how to change the title. The previos blog should have been entitled "An Imaginary Friend". This post is so that all will know that Jordan does have a real friend named Bryan Smith. Jordan has been asking me to post on this blog for some time now, but I for lack of a better excuse, have failed to learn how to blog. Even now as I am typing, I am unsure if this will appear anywhere or if it does appear have no idea where that might be. Three things seem to be certain, death, taxes, and blogging. So here is to Jordan and the blogging fad we all soon will join. My first post is not quite as spiritual or reflective as the others on this page. Several of my more posh friends have gone before me in this endeavor...Kellee McCoy, Jeff Noble and countless others lead the way in the blogging world. Noble even e-mails you to remind you to read his blog. However, I am willing to succomb to the pressure, even though I remain stellar in my boycott of cell phones, which I have never owned, but often use. Psa. 133:1 - "Behold, how good and pleasant it is when brothers dwell in unity!" 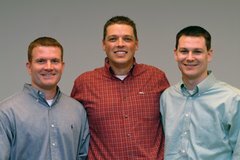 I thank God for Nathan and Bryan, and that I get to walk beside these brothers in planting Grace Church! We just finished another conference call and God supplied even more of His unifying grace! "The Christian's life should put his minister's sermon in print." For that matter, I love almost every quote on puritansermons.com! Here's a great site to stay current with social, construction, and governmental developments in downtown Memphis. I trust this will aid you in praying for Grace Church to have an impact on this city for the glory of God! You must check out this complilation sermon on sermonindex.net entitled "The Revival Hymn!" Be warned, if you are regenerate, you will experience conviction. Click here to listen to one of the best sermons I've ever heard!!! I'm not alone, it is the most listened to sermon on the web with over 30,000 downloads and counting! There are so many good things for FREE on this website! You should be shot for not listening to Pastor John's seminars under the Leadership Education/Pastoral Theology tabs, let alone the other great stuff. Did I mention it is all FREE? Here are several blogs that I frequently receive help from. This blog is authored by Justin Taylor, who was formerly John Piper's theological assistant, and now is the chief editor for the ESV Study Bible at Crossway in Wheaton, IL. This blog is authored by Anthony Carter who is another wonderful gift to Christ's Kingdom as he is being used to further God's purposes to advance theologically rooted racial harmony! Don't go overboard, but I trust you'll be helped from clicking on these links from time to time and staying current with important issues in contemporary theology. Is the gospel of Jesus Christ something that should be believed to "get in" to the faith and then placed aside? No, the gospel is central not only to justification (entrance into Christianity) but also for sanctification (continuing to grow in grace, evidencing genuine faith), and glorification (being absorbed into the glory of God in heaven). Here are some helpful resources that exalt the centrality of the gospel of Jesus Christ for an entire life of faith. Jesus, what is eternal life? "to know the one true God, and Jesus Christ whom He has sent." Our family enjoyed a wonderful week in Memphis last week. We were in town for a Southern Baptist Church Planter's Assessment. Thankfully, we received a very positive commendation from our assessor. Also, we praise the Lord for Union Avenue Baptist Church as they are in the process of becoming one of our partner churches. I was very blessed to be able to preach on Sunday morning at First Baptist Church of West Memphis as well. Thank you to all who are praying for us! The Lord is stirring our eagerness for Grace Church in every way! As I mentioned in the first meditation, I believe the proper translation of verse one would conclude, "...who are faithful BY Jesus Christ." One of the many reasons found in this chapter is here in verse two. We see clearly that grace and peace flow from both the Father and Son toward believers "who are faithful." But why? How was the river of grace opened to us? The reason I believe Christ is mentioned in verse two, instead of only God the Father (Such as in Colossians 1:2, the mirror letter of Ephesians), is because Christ is the one who purchased believers and eternal promises for them through His work on the cross (this is what remains in 1:1-14). Some have asked, "Why would you want to plant a new church in an area notorious for crime, well below the national average for household income, and on top of it all, an area where we would be a minority race?" Seriously, have we lost our minds? To some, like Festus, the answer will have to be "yes" (Acts 26:24-25). There are two ways this question should be approached; the surface, and what lies beneath. On the surface, there are obvoius implications that are driving this question. Those who have been submurged in suburbian living, nice fenced yards, two-car garages, remote controlled window blinds, nice countertops, homogenous skin-tones, and all of the other ammenities that many have come to view as "normal life," have immense difficulty with the notion that God would lead someone to forsake these "necessities." At this level, the question of "Why" we would desire to plant in urban Memphis is hard to answer because we are speaking a different language than the who is inquiring. At a deeper level, there is something being revealed about the heart of the inquirer, right? Christ said, "But what comes out the mouth proceeds from the heart, and this defiles a person" (Matthew 15:18). Is it wrong to live in the suburbs? No! Unless, of course, the suburbs are a way to fortify oneself in the pride of one's own culture! We are often duped into thinking that there are many noble reasons for operating in monocultural spheres of life. The key problem is that this wars against the gospel of Christ, Who has in His own flesh, "torn down the barrier of all diving walls" (Ephesians 2:14). To believe in Christ, who effectively accomplished God's atoning work on the cross, defeated-death, and secured salvation by His glorious resurrection, is of paramount importance during one's lifetime! The effect of this saving faith in Christ flows out of the true believer in a stream of redemptive love towards all people. I'd like to hear several saints from history answer the question that has been posed to me. Peter, who was crucified upside down. I wonder what he'd say about the "risk" of the inner-city? Paul, decapitated for his inner-city embracing love for Christ, I wonder what he'd say? Christ Himself, mangled, mutilated, and martyred for no just reason. I wonder how He'd answer the question? How could it be more rational to stay in the burbs with strong evangelical churches on nearly every street corner instead of taking a risk for the gospel in the city where there are few strong evangelical churches? So, in Gospel fashion, I would like to pose a question instead of answering the question. Could it be that God has "many sheep that are not of the suburbian fold that must come to Him also?" (John 10:16). We pray that the answer is "Yes!" Please pray with us. Our faith is small, we are easily discouraged by doubters, and we tend to drift toward comfort just like everyone else. "For whenever our heart condemns us, God is greater than our heart, and He knows everything" (I John 3:20)! We praise the Lord that the elders of Bethlehem Baptist Church voted unanimously last night to affirm the vision of Grace Church! In keeping with the Biblical pattern of Acts 13:1-3, after affirming our vision, the elders rallied around me, laid hands on me, and prayed a commissioning prayer over our planting team. This moment of prayer was incredibly rich, and it was very difficult to hold back the tears. May God be pleased to answer every single prayer that was requested by these brothers...the request were by no means small! Tonight, February 7, I am scheduled to present our church planting proposal for Grace Church to the elders of Bethlehem Baptist Church. These men love the Lord and love spreading a passion for His supremacy in all things for the joy of all peoples through Jesus Christ. We rejoice at the prospect of these men, and this church, becoming the "mother" of Grace Church! Thanks for your prayers as I present. Please pray for my mom, Debbie Thomas, who has been admitted to the hospital with prolonged high fever. Also, my grandmother, Josephine Duncan, who is battling a chronic sickness as well. Finally, my I've managed to hurt my back again and am dealing with tremendous pain. Thank you all! Ever wondered why God sent ten horrific plauges on Egypt in order for His people, the Israelites, to be freed instead of devising another way? Check out Exodus 10:1-2 for the divine purpose statement over such catastrophic evil and have your jaw drop as you commune with this very God in prayer today! Please join us in praying for each of the pastors to find housing in or near downtown. Thanks! Our faith is a bloody faith. Christ Himself sealed our salvation through His own ignominiously bloody death on the cross. Now, as His ambassadors (II Corinthians 5:20-21), we are to "proclaim the Lord's death until He comes" (I Corinthians 11:26). Today, as tasteless comical caricatures of Mohammad are causing a heated dissension around the world, we as believers in Christ are reminded that Christ's scorning is the emblem of our faith! Instead of outrage, we are to "rejoice and be glad" when we are insulted, persecuted, and when others "say all manner of evil against us falsely on account of Christ" (Matthew 5:11-12). Against all logic, our joy in persecution is deeply embedded in the persecution of our Head, the Lord Jesus Christ! Had there been no reviling of Christ, no scorn, no wagging of the heads, no spitting upon, no mockery, no bloody dangling on a cross as a piece of meat suspended between heaven and earth, we would have no hope at all! Indeed our hope is securely rooted in the fact that our Christ was the object of ridicule! Our bloody, throat-slit Lamb, is resurrected, ruling, and one day returning! In this interval between Christ's ascension to heaven and His return to earth, Christ has bid us to join in His redemptive purposes. But how? The gospel! The bloody gospel! Matthew 28:18-20 is not just the "Great Commission," it is the "Great Church Planting Commission." Where is church planting in the great commission? "Baptizing them...," that's where! This commission is a "local church" commission! How will we obey this "final command" of our resurrected Savior? By starting churches that preach a God-centered, Christ-exalting, Bible-saturated, Spirit-empowered bloody gospel! In America in the year 1900 there were approximately 30 churches for every 10,000 people. In 1950, there were approximately 24 churches for every 10,000 people. In 1996, there were approximately 16 churches for every 10,000 people. See the pattern? Every year about 3,500 churches "shut their doors" never to open again! On the flip-side, there are only about 1,500 churches started each year! Unfortunately we are on the retreat. More unfortunately this is diametrically opposed to Christ's teaching in Matthew 16:18, which teaches us to be on the offense with Christ in starting churches. Not neutral, not "holding our ground," but on the offense! "The gates of hell will not prevail against [the church]" (Matthew 16:18). The gates of hell tremble as we march forward with bloody-gospel proclaiming church plants. How will we obey the Great Commission? How will we engage in an obedience that "makes disciples of all nations?" Now, in God's gracious providence, America is being infiltrated by peoples from all nations of the world. Although a clear call to "go" exists in the Scriptures, we find ourselves uniquely poised to "go" to the nations by driving around the corner from where most of us live! Many other nations are beginning to see this reality and are viewing America as one of their primary mission fields! So, what is the bloodiest verse in the Bible? The bloodiest verse is the verse that commands us to make disciples of all nations. Why? In order to fulfill this command, and make disciples of Christ, we must introduce all nations (literally, "all the people") to our bloody Savior! "The gospel" of the capillary-bursting blood vessels of Christ, the cat-of-nine-tails shredded back of Christ, the nail-punctured hands and feet of Christ, the thorn-embedded skull of Christ, and the spear-injected side of Christ, the dead and borrowed-tomb buried Christ, and the resurrected All-Authoritative Kingly Christ, who in His death took the sins of man and exchanged them for the righteousness of God! This gospel "must be proclaimed throughout the whole world as a testimony to all nations (literally, "all the people"), and then the end will come" (Matthew 24:14). Without this bloody gospel, there will be no disciple making among the nations! There is one entry for disciples into the local church, and into a proper "baptism in the name of the Father, Son and Holy Spirit (Matthew 28:18-20), and it is the gospel of the bloody cross of Christ! Dominion, Desires and Deserves Honor; Amen! - Carefully reading our Bible is fuel for seeking God (active and passive words matter)! - God gives us Himself, which is our greatest need...so give others God! What is the first thing a new believer needs? According to Barnabas and the Apostle Paul, based on their ministry in Acts 11, it is a year's worth of solid theology! Having a solid biblical foundation is the cure for a thousand "felt needs." The pastors of Grace Church were able to spend the past seven days together in Minneapolis. Our times of prayer, planning, conference attending, and fellowship were blessed by the Lord. Please continue to pray for us as the day is drawing nearer for Grace Church to become a reality.